Full text is a critical point when it comes to mysql. It used to have that feature in MyISAM but that’s not really maintained anymore nor it is advised to use unless you have a very specific use case in which it might make sense. There are 3rd party solution which takes the problem away (Lucene, Sphinx, Solr, ElasticSearch) but all bring extra complexity to your setup which has its own cost. So do you need to give up on fulltext search if you’re using MySQL + InnoDB? No! Definitely not. I have an live database with 9000+ products with category, brand and short description which is perfect to test my searches on. 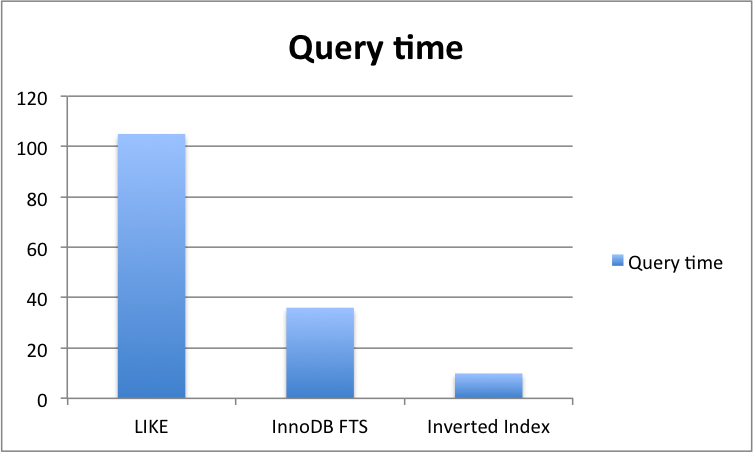 I’m going to run the queries many times and use profile information to collect more granular and accurate timing information. Well… It’s not a real alternative but just for a sec see how well it behaves. There are solution which could work without materializing but since the primary goal for this test to compare performance I didn’t consider these as viable options. What is inverted index? An index data structure that maps content such as words or numbers to their location in a file, document or sets of documents. It’s widely used in full text searches. Basically you trade disk space and extra computation on document insertion for speed on the search. Actually InnoDB FTS index is using inverted index as well internally but it’s only in 5.6 and it’s a bit rigid of what and how can you use it. Don’t forget to also change your query to search for the stemmed term. And that’s it. You have a fully functional feature rich full-text search which is performing very well and can be implemented in any database. Getting this idea and take it further you can also do tokenizing by removing accents, replace different characters to whitespace or anything else you can possible think. 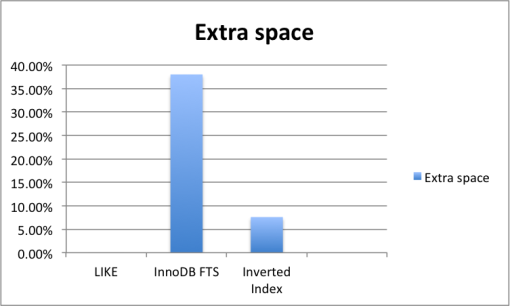 Tagged fts, full text search, innodb full text search, inverted index, mysql, n-grams, performance, stemmer, stemming.